I wrote previously about how I frogged a jumper I had knitted and was going to make it into a chevron blanket. When I looked back to find the post I discovered it was quite some time ago, December 2012, so the blanket should be finished. It is almost finished, I just have to sew in the ends. I am really happy with the way it turned out. The colours are actually a bit brighter than shown here but I think the colour combination is striking. This is the first time I have attempted crochet on such a large scale. It was a good project to have as an on-going project when in between other projects. I used Size 4.00 crochet hook and double knitting/8 ply wool. The yellow was bought and the grey was from a frogged jumper so there is a slight variation in the tension of the two colours. The stitches used are chain and single crochet. Sk first st from hook; work 1 sc in each of the next 2 sts inserting crochet hook in the horizontal thread in the back of ch st ; sk 1 st; * 1 sc in each of next 15 sts; 3 sc in next st; 1 sc in each of next 15 sts; sk 2 sts. Repeat from (*) nine times, the last time sk only one st; 1 sc in each of last two sts. There should be ten scallops. Ch 1 – turn. 1 sc in each of first 2 sts, taking up both threads of st below; sk 1 st * 1 sc in each of next 15 sts, taking up the back threadonly of sts below; 3 sc in back thread of next st; 1 sc in each of the next 15 sts; sk 2 sts. Repeat from (*) nine times the last time sk only 1 st at end of point; 1sc in each of last 2 sts taking up BOTh threads of st below. Repeat the second row for the entire rug. I used ten rows for each colour. The finished rug measures 120 cms long and 110 cms wide. 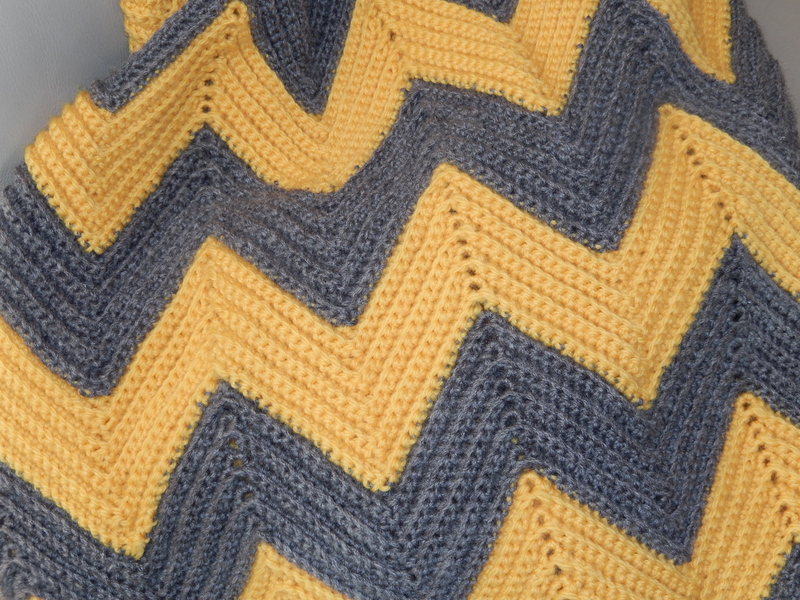 This entry was posted in Craft, Crochet, DIY, Gippsland, patterns and tagged chevron blanket, chevron rug, craft, crochet, crochet patterns, free crochet patterns, free patterns, frogging, patterns, recycling, wool by suth2. Bookmark the permalink. I have made several of these over the years. Thanks for sharing the pattern. I don’t know if I will make another one. Maybe if I frogged another jumper in the future. Thanks Megsy. This one took a bit of time as I only did it as an in-between project. I haven’t been doing too much craft lately. I seem to have been doing more reading than anything else. Hi, just wanting to start this blanket but when I start with 337 chain, its way bigger than yours. Im using a 4.00 hook & 8 ply. I am wanting to make this as a cot blanket beeing about 100cm wide. What do you suggest I do? If you just have the chain it does look really big but once you start the actual pattern it shrinks in. Try a couple of rows and see how that goes. It should be the same as mine. I have said it a million times — EVERY home needs a crocheted ripple blanket. That’s just the truth. The pattern is easy-peasy and also easily adapted for knitting if you prefer. Get hookin’! Absolutely beautiful. Shame I can’t crochet. I thought the blog said it could be adapted to knitting, but I couldn’t find it. The comment prior to your comment mentions that the pattern can be adapted for knitting. Perhaps Crafted may have something on their blog or otherwise check out Ravelry. Thank you…I found a really easy pattern on http://www.redheart.com with only 2 rows to the pattern. I have adapted it to what I wanted, so really happy about that! Glad you were able to find something. I used the frogged balls of wool from a man’s jumper and I think I bought about ten balls of the yellow but it could have been more. I was just recycling with some added wool. Sorry I can’t be more specific. The wool I used is 8Ply also known as double knitting. I can’t be specific with the amount of wool used as I was recycling wool from a frogged jumper. The grey was from a man’s jumper and I bought about 10 balls of yellow. Sorry I can’t be more specific. Hello! This blanket is just what I was looking for, but I want to make it smaller, for a baby blanket. 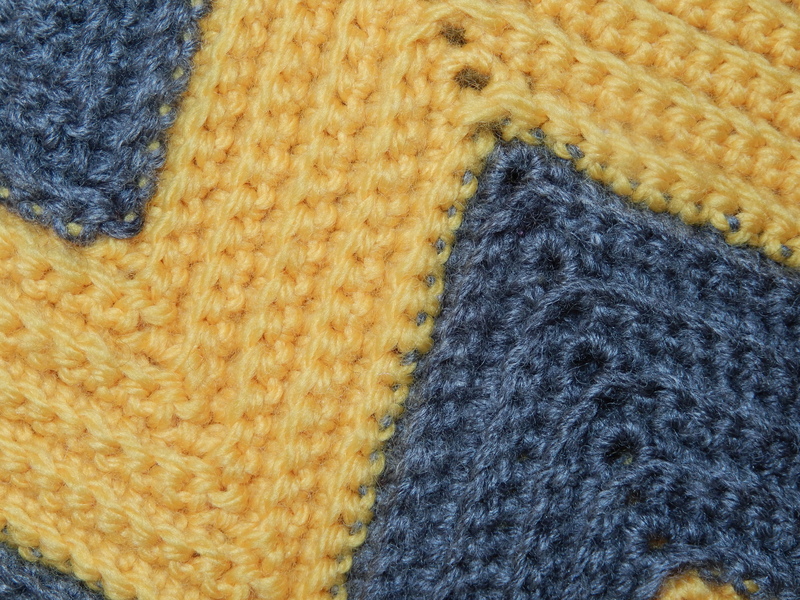 What is the stitch multiple? I’m not good at figuring that out….. I am not much good at working this out either. I think you need 33 stitches for each chevron but you also need to include the stitches at the side before the * in the pattern. I hope this is of some help. 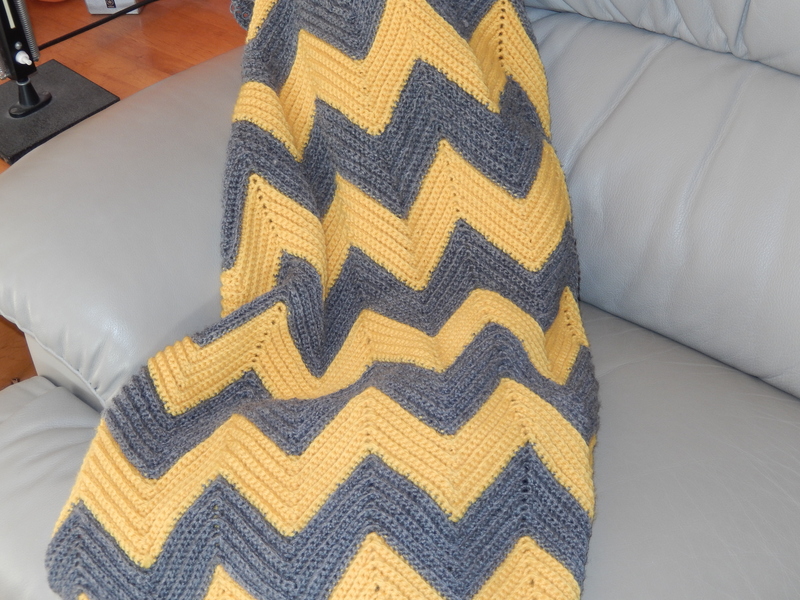 There were ten chevrons in the blanket I made.